The best Petunia in fabulous 'Union Jack' colours. We’ve done the selecting for you – just plant them up, water them and watch them grow! Guaranteed to give you fabulous red, white and blue colour all summer. Your neighbours will think you're a gardening pro! 'Patriotic Petunias' collection plugs are supplied as a mix of 12 plugs in Union Jack colours. Quick and easy, we've selected the best mix of colours to give you amazing results. The perfect solution for gardeners who have been scuppered by the winter, this collection is guaranteed to give you fabulous results - just plant them up, water them and let them do their thing. Consistent and predictable results every time, the Patriotic Petunia Collection is a spectacular profusion of tiny petunia flowers in red, white and blue. You can rest assured that the collection will flower together in perfect harmony in a glorious patriotic tribute. Giving you superb colour in your garden all summer long, our top quality, UK-grown plants are the easy way to a perfect garden display this year! Supplied as 12 Jumbo plugs in a mix of red, white and blue, ready for potting up and growing on. 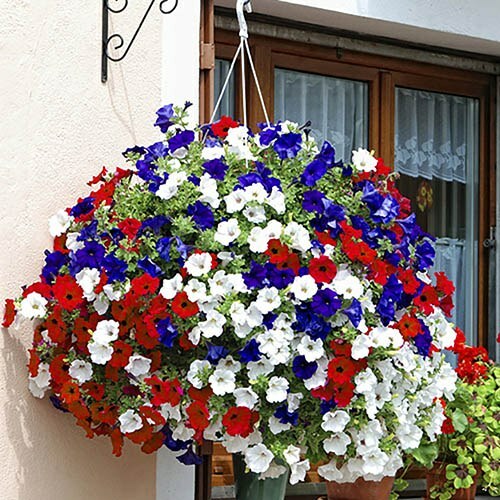 Supplied as 12 jumbo plug plants in a mixture of red, white and blue.